This post is the eighth in a recent guest series on my blog featuring science bloggers who recently got their start in the science blogosphere. This series of posts I'll be inviting from new science bloggers, or anyone who started blogging about science in the last year or so, will help paint a picture of how science bloggers get their start today. *If you want to contribute to this series, and you recently (within the last year or so) started any form of science blogging, e-mail me at pbrow11[at]tigers.lsu.edu. You can either write a free-form post, or I'll send you a list of Q&A questions to guide you. Thanks! Eighth up in the "New to Science Blogging" series is Ian Street. 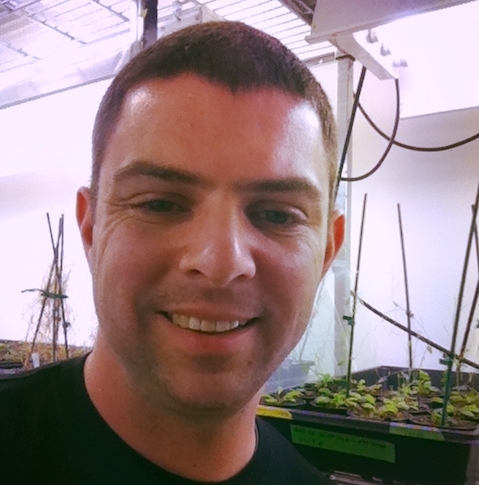 Ian is a postdoc studying plant hormones and development. He has been blogging for a few years now about postdoctoral life, but only recently started a new blog devoted to plant science – The Quiet Branches. “I consider it my ‘real’ attempt at science blogging and storytelling,” Ian said. When not doing science, Ian is outside running, writing at his other blog Postdoc Street, and looking after his cat, Niles. Me: What motivated you to start blogging about science? Why did you start a blog, vs. using only other newer forms of social media like Twitter? Ian: I've been blogging for a few years about academic life and I've been thinking about a science blog for years. Good science writers have always inspired me. To the point that it's something I've wanted to try my hand at for a long time. This year was the year I finally bit the bullet and did it. It took making writing a real habit in my life, feeling like I had something to contribute, and a basic design/concept/idea for the blog. In January, The Quiet Branches was born. I've posted every week. It is my form of teaching right now. I've heard from several people that they like the blog and even some undergrads are paying attention, perhaps to get ideas/sources for some of their own assignments. And then there's the fact that I am trying science writing out as a potential career direction. I like the blog/article form because it permits a deeper dive into a subject. I like Twitter, and use it regularly, but it's not a platform for deep dives into subjects, which is more what I'm interested in doing. Plus, the blog platform is more flexible format-wise. The fact that you see the title of the blog with the picture of the daisy seedlings as a backdrop is part of the idea of getting a moment of experiencing nature before diving into reading. Me: How did you navigate deciding where to blog and how to blog about science? Did you have an idea of what the blog would be before you started? Can you describe that and perhaps where it came from? Ian: I did have the idea for the blog; or at least the idea to write about science. And since I work on plants, it made sense to write about those. As far as platform, I already had a WordPress blog, so I decided to stay with that for my science blog, but to register the domain name for it. It took me a while to get a design down and I still want to improve it if I can, but I'm focusing on generating content right now. I did look at Squarespace, but decided against it... it seems like it isn’t really geared towards the kind of blog I'd like to write. The ultimate idea for Quiet Branches came from the fact that I’m an introvert and that plants are often unrecognized in the world; plant blindness is a thing. The inaugural post on the blog was all about why I named it that. Me: How do you feel your blog is evolving now, if at all? Ian: I have noticed that there seems to be a theme running through the blog that lets me cite my old posts frequently... it's almost as if each post is a short chapter in a book I didn't know I was writing. I’m telling the stories of plants as best I can. The conscious transition I made was from talking very broadly and generally about plants to really digging into basic research (both current and historical) and telling the stories that don't often get told. I hope I'm learning to write better, edit myself well and express ideas clearly... and I hope I’m telling good stories. I'd like to start a newsletter and, if I ever get more time, to devote a second short post each week to a blurb about a science publication, a poem about plants or some piece of culture about the plant world. Me: How you are finding your niche in the science blogosphere? Have other science bloggers influenced you or your blog direction, and if so how? Ian: I think I'm occupying a niche between research, culture and history; it's not just straight science. And I hope I’m writing for people beyond just fellow scientists; I aim to be readable by high school level students. That said, I think I'm still finding my niche in a lot of ways. I am still writing for myself and following my own curiosity. Other bloggers are an influence; I get ideas from many sources, including other science writers/bloggers. Sarah Shaile's Plant Scientist blog is one I know I've taken inspiration from. Mary Williams shares a ton of great stuff (though is not a blogger in the strictest sense). But a lot of the influence is in format/storytelling/style; I try to be like the NatGeo Phenomenon Bloggers, for instance. And I seem to have a heavy dose of skeptical community influence as well; really trying to follow the science (like The Skeptic's Guide to the Universe, etc.) I also am taking inspiration from podcasters; The Stuff You Should Know podcast is a big influence, as is The Infinite Monkey Cage (the use of humor is great). And of course, I try to highlight forgotten people in science (often women) like Barbara McClintock. I've gotten that idea from many sources as well; Karen James, BiochemBelle and others who I'm sure are slipping my mind right now. There are also sites like Gizmodo and Lifehacker that I read regularly, and some of my posts are influenced by that style as well. In the beginning, I was offering my perspective, for sure, but was careful not to inject strong opinion. But I've done that twice now with a post on the history of the discovery of cytokinins (60 years!) and linking it to the current ideas to change the fundamental mission of the University of Wisconsin by the Governor there. And in a recent post I wrote about the naturally GM [genetically modified] sweet potato, basically arguing for the science that GM is safe (88% of scientists think so) and trying to untangle the complexities of that. However, I try to stay grounded in the science and why science is of enormous benefit to society. Me: Please describe any other experiences you have had in starting a science blog, or being a new science blogger online and finding your "place," that you feel have been relevant to the direction or content of your blog now. Ian: It's a lot of work! Even the one post each week I do takes a lot of planning and effort and I'm not sure I'm living up to my standards each week, but I committed to publishing one post a week this year and I've done that with the exception of the weekend I was sick and I re-shared an old post. There's also some ambitions I have that I haven't been able to carry out yet, like starting an email newsletter for the blog and banking posts to bring out when I don't have the time to write a new one. And of course, I’m trying to figure out how to share my content with the world efficiently. I tag people I think might be interested in a specific post on Twitter, or I tag the journal that published the research I cite in a post, etc. But I feel like there's something I'm not doing that I should be... maybe using something like Buffer to schedule my posts. Me: Are there any struggles to being a "new" science blogger? Ian: In this world of really fast and gorgeous media, it feels like it's hard to get noticed just writing. I am grateful to anyone who reads and shares. Coming up with new stories each week is hard sometimes. And being new, and not really practiced in journalism, I feel like I'm making all sorts of errors; one I can point to is not citing a co-PI on a paper. I also made a scientific error in that post that one of the PIs wrote to tell me I got wrong. I fixed the errors, but it really just highlights how easy it is to make a mistake. I also struggle with how to cite references sometimes (as in format; just link out or cite at the end like an academic manuscript?) and the balance of block quotes and images. I also wonder if I'm filling a niche at all; I don't think the world was clamoring for a plant science blog, but I am writing it because I like doing it. And for now, that is good enough for me. And last, since it isn't really my day job, I struggle with how much time to devote to it each week; but it is fun. And I am excited to write it each week. P.S. I thought of one more challenge; a psychological one. Anyone can set up a blog on the internet, and I struggle with how to measure how legitimate I am as a scientist/writer. There's not really peer review in blogging, so it's been a little hard to get past the idea of needing external validation for what I do. Any thoughts on Ian's struggles as a new science blogger? I definitely go for linking out to references, but I know many other bloggers (including Ed Yong) who include references at the bottom of their posts in academic style. As far as peer review for blogging - sites such as The Winnower might change that, at least for some academic blogging. Bloggers can now give their posts DOIs, for example. But peer review of blog posts is likely to remain a rare and haphazard occurrence for the near future, so the better question might be how do blog readers currently gauge the legitimacy of science blogs/bloggers? And how do academic departments currently reward (or not) science blogging efforts? New to Science Blogging #4 - Life et al.